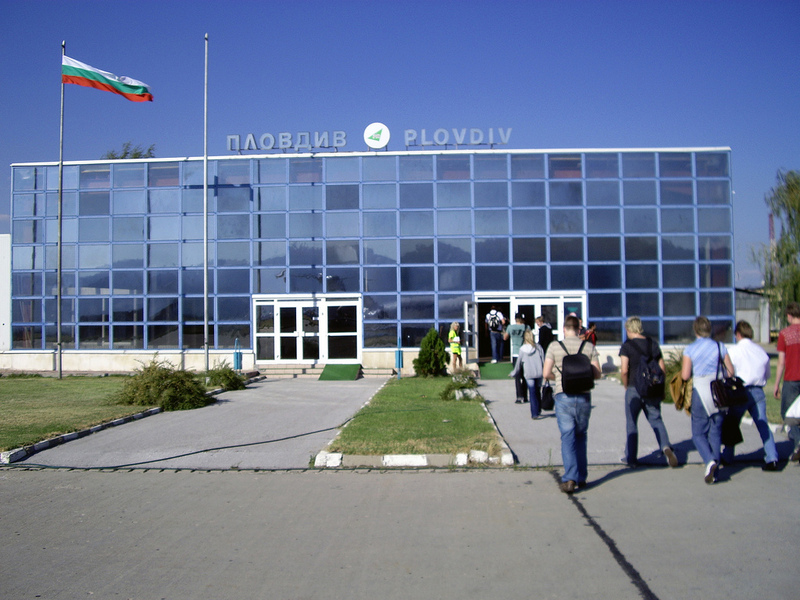 Plovdiv Airport (Bulgarian: Летище Пловдив, Letishte Plovdiv) (IATA: PDV, ICAO: LBPD) is the airport of the second largest city in Bulgaria,Plovdiv. It is often referred to as Plovdiv Krumovo Airport, after a small village located 6 km south-east away from the city on the main Plovdiv-Asenovgrad highway. Due to its location near the popular ski resorts Bansko and Pamporovo, the airport is most active during the winter season. The main traffic at present is charter flights to and from the United Kingdom, Ireland and Russia. 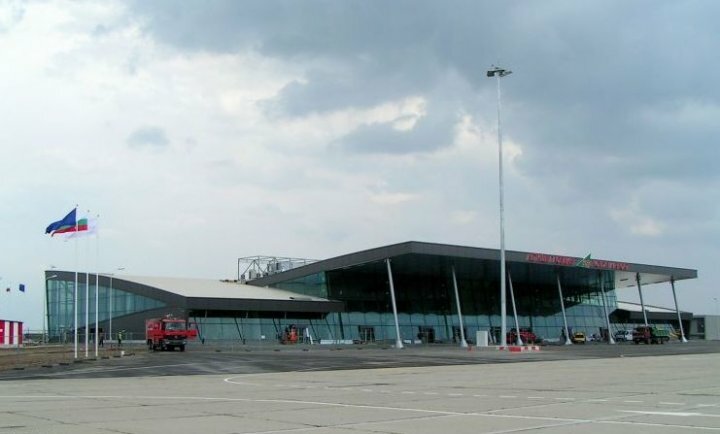 The airport also plays a vital role in case of emergencies and is sometimes used as an alternate for Sofia Airport, which is almost 150 km away or 1.5 hour drive on the Trakiya motorway. On 25 December 2009 the first service to a scheduled destination, Moscow, started. This was the first scheduled flight since 1981. The beginning of civil aviation at Plovdiv came with the first test flight between Sofia-Plovdiv-Yambol and Burgas early in 1928. In 1947 nterim civilian flights between Sofia and Plovdiv was carried out. On 2 October 1947, the regional newspaper “Fatherland Voice” reported that over a period of 45 days 1,500 passengers were carried, noting that the flights were always on time. In May the next 1948 regular return flight began between Sofia-Plovdiv-Bourgas and Varna. The same period also saw the former Fifth Air Regiment getting established at the airport, and a ticket office was put into use. The first flight was carried out by the airline Balkan Bulgarian Airlines with aircraft types called TABSO, S-2, and with Li-2. During the Fair Plovdiv airport served an average of 25 aircraft per day. On May 2, 1962 the airport operations moved to the Graf Ignatievo Airbase north of the city. At Plovdiv major restructuring of the airport facilities was carried out. One year later the regional newspaper “Fatherland Voice” published an article with the heading: “He has TRACK OF AIRPORT Plovdiv”. In the same article the public was informed of the expansion of charter flights by Balkan Bulgarian Airlines to such destinations as Berlin, Moscow,Prague, and Vienna; the flights were carried out with aircraft types IL-18, TU-104 and TU-114. On 13 September 1965 a new terminal building was opened, and next year an enlarged tarmac was put into use in time for winter season charter traffic. During these first years at the new location on the north-west perimeter of the airport, the airport serves scheduled domestic passenger flights toBourgas, Varna, Targovishte, Rousse, Sofia and Gorna Oryahovitsa, with mainly IL-14 aircraft. In the 70s the airport underwent considerable improvement and cargo airline Aeroflot Cargo began regular operation with IL-18, AN-12 and TU-154. In 1972 more than 5,000 tons of air cargo went through the airport. On the 18th of April 1978 an IL-76 landed at the airport, with a gross cargo payload capacity of 40 metric tons. On December 18, 1982 the first aircraft TU-134 arrived, a charter flight from Amsterdam, the beginning of a new era for Plovdiv Airport. It is followed by the arrival on the 3rd of November 2010 by a Boeing 737-800 arriving from London Stansted Airport, opening a year-round international passenger service to and from Plovdiv Airport. The airport was the setting for the climax of the 2012 American film The Expendables 2. Plovdiv Airport - The old passenger terminal. 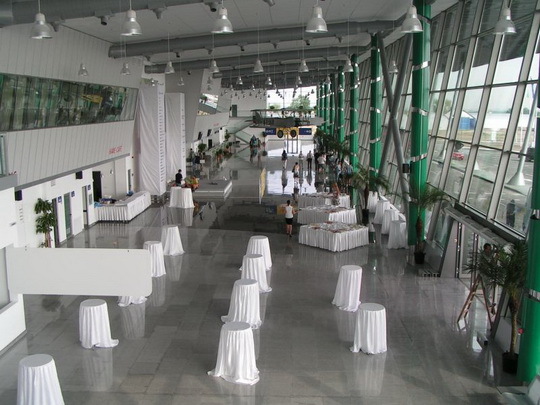 Plovdiv Airport - The new passenger terminal (interior). Although the airport is operated by the state-owned Letishte Plovdiv EAD and the runway and the apron are also state-owned, the terminal is partly private. That made the renovation of the terminal very difficult. Today the terminal is 58.08% owned by Alfa Finance Holding (former owner of these shares was the Swiss firm TADO) and the rest of the shares belong to the state-owned “Mezhdunarodno letishte Plovdiv” EAD. The problems in agreement with the private owners of the terminal brought the decision from the state to build new terminal and to extend the apron. The renovation process started at the beginning of 2009; the apron extension for 6 additional aircraft stands was made by Glavbolgarstroy and the new terminal building by a local firm. The new terminal building was officially opened on 1 July 2009. The new passenger terminal building has 10 check-in desks and 6 gates. It is designed to handle a capacity of 500,000 passengers a year. The cost are estimated to be �20,000,000. According to British consultants from Airport Strategy & Marketing, which were hired to investigate possibilities for developing new routes, there is big interest from low-cost carriers like Ryanair and Wizz Air. Next to the airbase is the only functional aviation museum in Bulgaria. Opened in 1991, the museum has a rich collection of modern, cold war airplanes and such from the Third Bulgarian Kingdom. Due to the low state budget, the collection is preserved mostly by donations. The museum is accessible by car on the way to the airport and is about 100m from Mavrudovo railway station. Working hours for visitors are 9:00-16:00.